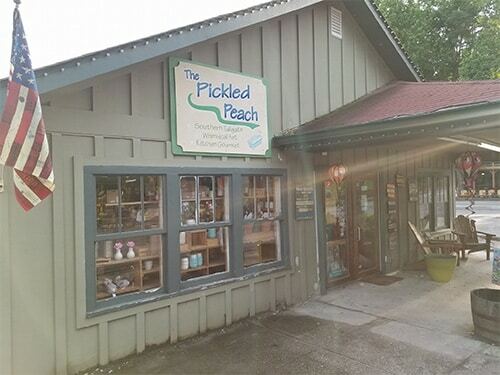 Did an emergency service call and lock repair on a Friday evening at The Pickled Peach in Helen, Georgia. Danny’s Lock and Key is a 24-hour mobile locksmith servicing the Northeast region of Georgia. 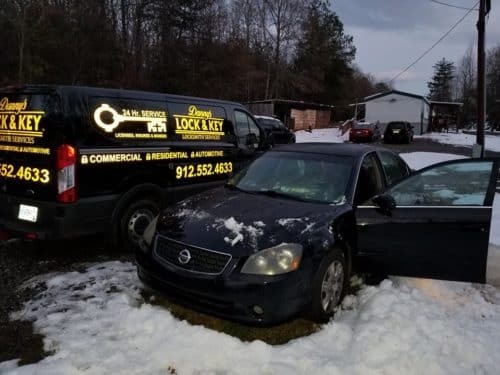 Our full-service mobile locksmith can reach anyone in White County GA, Hall County GA, Banks County GA, Habersham County GA, and Stevens County GA and all the cities within. You’ve locked your keys inside your home, car, or office. Your front door deadbolt is jammed and your key won’t turn. You’ve broken your key off in your motorcycle, mobile home, or apartment door lock. The ignition lock on your truck or boat is stuck and won’t turn. Our locksmith vans are fully stocked with all the tools and equipment necessary to help you out with any locksmith emergency you’re having. Give us a call and rest assured we’ll come to you wherever you are, no matter what time it is. This customer had locked their keys in their car, and we got them back in after normal business hours. We can service all the locks and keys on your automobiles, trucks, vans, motorcycles, and even boats. Is your key bent or worn out? Do you have to jiggle the key to get it to turn in the ignition? If your key is roughly ten years old or more, it might be wearing down to the point of needing a replacement key. At Danny’s Lock & Key, we can handle all your home security needs. You might be wondering, other than unlocking my door, what else can a residential locksmith do? We’re glad you asked! We can repair door locks including mortise locks, rekey deadbolts and knob locks, install new deadbolt and picture handle sets, and even reinforce door frames to either prevent kick-ins or repair the door frame if you’ve experienced a break-in. Northeast GA is home to a growing number of business that have an ever-increasing need for security. As a business you want your customers to feel secure. More than that, you want to make sure that your inventory and petty cash is secure. What better way than to implement a master key system or install a cash safe or dropbox? Danny’s Lock & Key offers professional commercial locksmith services to businesses throughout Northeast Georgia. As a registered and insured locksmith, part of our business is staying up to date with all the latest techniques to unlock doors, program car keys, install electronic locks and more. With over 20 years in the business, we’ve seen huge shifts in the industry from mechanical locks to electronic locks that communicate with smartphones, and we make sure we stay up to date on all of it. Our locksmiths have completed training classes and obtained certifications for such products and services as Simplex Locks and GSA Certification. No matter the case, your security will always be our main focus.